When I was little, I loved the Chronicles of Narnia series. I had a box set and read them all. I didn’t remember much about them, other than that I loved their dark, mysterious stories, when I decided to pick up the first one, The Lion, The Witch and the Wardrobe, to read to my 6 year-old son. He’s a bit younger than I was when I read them (I read them to myself) but we’re in the chapter book phase now and I thought he might like them. 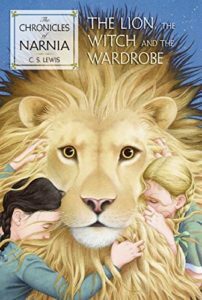 The Lion, The Witch and the Wardrobe is about four siblings, Peter, Lucy, Susan and Edmund, who are evacuated from London during WWII and sent to live with a professor in the countryside. Bored, they spend their days exploring the professor’s big house. One day, the youngest, Lucy, hides in a large wardrobe and finds herself transported to a magical, snowy land called Narnia. When she returns to the wardrobe, no time has passed in real life and her siblings do not believe her. But soon, her brother Edmund also ends up in Narnia, and before long all of them have gone through the magic wardrobe. Narnia is under the spell of a wicked witch, who has imposed permanent winter across the land. The spell can only be unbroken when four humans come to Narnia and sit on thrones in the castle. When the kids end up in Narnia together, Edmund is captured by the witch, while the others try to liberate Narnia with the help of a noble lion-king, Aslan. I enjoyed revisiting Narnia and The Lion, The Witch and The Wardrobe. It feels just a bit dated, from the British slang to some of the comments about girls, but the book sparked my dormant sense of wonder at fantasy stories about faraway lands. (I don’t read much of that anymore.) I also recognized the Christian imagery, for which C.S. Lewis is famous, much more this time around. It was pretty much lost on me as a child. I found some of the book a little scary for a six year-old (one of the characters is captured and treated as a prisoner; Aslan is killed; there is a lot of description of battles and casualties) but it didn’t seem to bother my son. There are good themes for kids here: loyalty to your family; triumph of good over bad. We’re going to start the next book in the series soon. 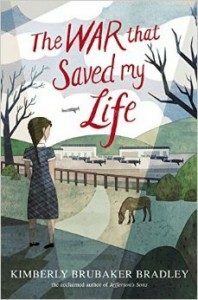 Our January mother-daughter book club read was The War That Saved My Life by Kimberly Brubaker Bradley. It’s an old-fashioned type of book about England during WWII that was published in 2015 and written by an American author who lives in Tennessee and . The War That Saved My Life is about Ada, a girl born with a clubfoot to a monster of a mother in London. Because she cannot walk due to her deformed foot, her mother has kept her inside a small flat for her whole life, never providing her with crutches or even a pair of shoes. Ada spends her life watching kids out her window and waiting for her little brother Jamie to arrive home from school. Her mother is unspeakably cruel, depriving her of affection, food and stimulation, and occasionally locking her in a roach-infested cabinet under the sink for small transgressions. When Jamie is given the opportunity to go to Kent in the English countryside to wait out the war, his mother decides to send him but keep Ada behind. Ada instead accompanies Jamie to the train and goes with him to Kent. They are passed over by all of the families who have agreed to take in evacuees, and end up at the home of Susan Smith, a single woman who keeps to herself. Under Susan’s care, Ada learns to live. After cleaning up the kids and feeding them proper amounts of food, Susan slowly starts building up Ada’s confidence and teaching her about how to interact with the world. As the book progresses, their relationship deepens. Susan has her own demons – she has been ostracized by the town and disowned by her father, presumably because of her sexual preference – but she sees Ada for who she is: a bright girl who has been severely deprived through her life and who deserves respect and opportunity. The tension ratchets up as the German bombs get closer to Kent and evacuated children begin returning to London. Will Ada and Jamie stay in Kent with Susan, or will their mom show up and lay claim to them? I liked The War That Saved My Life a lot, as did the girls and moms in our book club. There was a lot to discuss about Ada and Jamie and how they responded to life with Susan. Were they likable? Sympathetic? Was there anything redeeming abut the mother? Would we have taken in evacuated children? How would we have responded to such a dramatic change in our lives? I listened to half of The War That Saved My Life on audio and read the other half. I liked the narrator, who had a plucky British accent that made Ada seem perhaps a little happier than she really was. But it was a good production and I enjoyed the audio a lot. I needed to finish the book quickly so I chose to read the second half rather than listen to it. Overall The War That Saved My Life was a good pick for book club and seemed to have been enjoyed by everyone. It’s a good piece of historical fiction for the middle grade set. Sadly, my month of non-reading continues. Hoping to snap out of it soon. 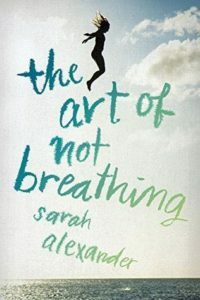 Meanwhile, here’s a review of our November mother-daughter book club book, The Art of Not Breathing by Sarah Alexander. The Art of Not Breathing is an odd, sad book. Elsie is sixteen and feeling very alone in her fractured family, which consists of her unhappily married parents, her older brother Dillon, and her twin brother Eddie, who died by drowning five years earlier. Elsie is convinced that her father blames her for Eddie’s drowning, and while she vaguely remembers that day, there are a lot of details that she can’t get a handle on. Why was Dillon there too? Did he try to save Eddie? What role did her parents play? Elsie feels like an outsider in her family and at school too, but when summer comes, she accidentally falls in with a group of older boys who free dive, a rigorous sport involving diving to low depths and holding one’s breath before coming up. Elsie decides to try free diving, and her connection to the group of divers leads her to a boyfriend and, ultimately, the answers to her questions about Eddie’s death and the role she – and others – played in it. Meanwhile her family falls further apart as Dillon develops anorexia and her parents grow more estranged. The Art of Not Breathing is compelling in that it makes you want to read on and find out what happens. You also feel just terrible for Elsie, who is trying to hold things together but is breaking down inside. Her unwillingness to confide in anyone is frustrating, because it only makes her more isolated. But she is dealing with a lot – way more than someone her age should be expected to. Our group of twelve year-olds didn’t love this book (though it was recommended by someone in the group). They all found it very sad, and were frustrated with the adults and the situations Elsie was put in. We all found free diving intriguing but also scary. And of course, poor Eddie… the most tragic figure of all. On the plus side, The Art of Not Breathing does send a message about being yourself and not caring what people think of you. It also conveys the importance of emotional trust, especially when dealing with grief. 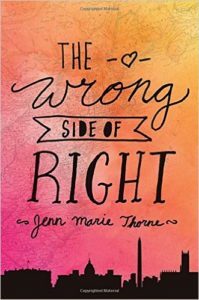 Our October Mother-Daughter Book Club pick was the very topical The Wrong Side of Right by Jenn Marie Thorne. The book is about Kate, a sixteen year-old girl who discovers that her father, whom she never knew about, is a Republican senator from Massachusetts who is running for president. This news comes to light (via a leak to The New York Times) a year after Kate’s mother died in a car accident and five months before Election Day. Kate has a decision to make: keep living with her aunt and uncle in South Carolina, or move to the Senator’s house in Maryland with his wife and twins and live a life in the spotlight while she travels with the family on the campaign. She moves to Maryland, and what follows is a whirlwind of campaign stops, photo opportunities, interviews and events, with some time squeezed in to get to know her new family. The Wrong Side of Right is about a young woman figuring out who she is and what she stands for, without much help from the people around her. She finds an unexpected ally in her stepmother, but is repeatedly disappointed by her father’s remote disinterest despite her attempts to get to know him. The plot of the novel is implausible in many ways – the secrecy of her paternity and the convenient timing of its reveal, for example – but the depiction of the modern campaign definitely rings true. (If only our current campaign were as tame as the one in the book!). Cell phones abound, and there’s even a love story thrown in to keep teen readers interested. (With the president’s son, no less!) Kate is a relatable, imperfect main character whose situation might be highly unusual but whose feelings are not. The Wrong Side of Right was enjoyable and compelling, and I wanted to keep reading to find out what would happen. Our book club had a good discussion about the reality of living through a presidential campaign and the ethics of the Senator’s behavior throughout the book. Not everyone finished the book, as it’s pretty long, but those who did seemed to enjoy it quite a bit. And it was perfect timing, with the current election three weeks away. 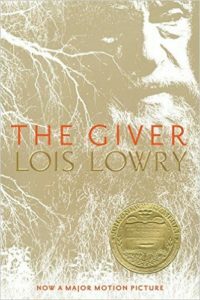 Our mother-daughter book club pick for September was The Giver, by Lois Lowry. The Giver is one of those books I’ve always heard about but had never read, and because it was on the girls’ summer reading list for school, I made it the first book of the year. I’m glad I did. The Giver is about a futuristic society that celebrates Sameness. There is no color, no music, no variation. Children are born, assigned to parents, grow up, and are given roles in the society based on their talents. They marry, raise their own two children, and then live out their lives until they are “released” to another land. The book centers on Jonah, a boy who turns 12 and receives his vocational assignment: a Receiver. This means that he receives memories from an older member of the society, who passes along institutional memories from many generations back. These memories are of sensations long gone – pain, joy, love – as well as evils that have been eradicated, like disease and war. They even contain memories of nature that have basically been engineered away – snow, birds. As the Receiver, Jonah must process and absorb these memories, but he cannot share them with others unless he is asked to advise the community’s elders. The Giver is a disturbing but thought-provoking book, and one that is great for middle school readers. It prompted discussion questions about the costs of giving up freedom in exchange for predictability and safety, and about individual responsibility in a place where most people don’t understand what is really happening. What is the role of parenting in this society, and of marriage? Would you want the responsibility of being the Receiver? We ultimately concluded that while there are a lot of things wrong with our world today, the answer isn’t to get rid of emotion, variety and individual choice. I can understand why The Giver was such a sensation. I am always surprised to find that I like dystopian books as much as I do – Station Eleven, The Age of Miracles, The Hunger Games. Maybe it’s time to broaden my horizons a little more? More important, the 7th graders (I can hardly believe I just typed that – we started this club when they were in 1st grade!) enjoyed it too and seemed to get a lot out of it. Our last mother-daughter book club read for the academic year was Flipped by Wendelin Van Draanen. Flipped is the story of a friendship between Julianna and Bryce, who meet in second grade when Bryce moves in across the street from her. She is instantly smitten with him, while he is put off by her intensity and immediate attachment to him. For the next 6 years, Bryce basically tolerates Juli, and she continues to indulge her crush, sitting behind him in class and smelling his hair. Fast forward to 8th grade. Bryce and Juli are still in school together, and she still likes him. 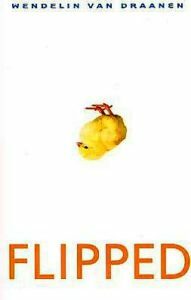 Flipped relates what happens that year in chapters that alternate between him and her, in he-said she-said perspectives that reveal, of course, that both characters are more complex than they appear. Juli is a free spirit who raises chickens and mourns the loss of her favorite tree, while Bryce is a popular boy who keeps his emotions in check and cares what people think. But Juli starts to grow on him. He won’t admit it, but he cares about her feelings and admires her passion. And Juli gets to know Bryce’s family better and learns that he is not perfect. In fact, he can be thoughtless and inconsiderate, which we know, of course, because we see his side of things. I liked Flipped. I thought the characters were textured and interesting, and the way the year played out was pretty realistic. The book had an old-fashioned feel to it, which I enjoyed. Oddly, the girls in book club did not it that much.A few thought it was boring, while a few thought it was anti-feminist, which I didn’t agree with, because Juli never compromises herself or acts like someone she isn’t – she just has a crush! She was a strong female protagonist. I was surprised that the girls didn’t enjoy the book as much as I did. FYI – there is a movie version of Flipped with a good cast – Anthony Edwards, Aidan Quinn, John Mahoney – which came out in 2010. We watched it after book club and we really liked it. Rob Reiner directed it and set it in the 60s, which felt pretty natural. So if you do read the book, check out the movie afterwards. Our May mother-daughter book club read was Red Thread Sisters by Carol Antoinette Peacock. I’ve always been interested in Chinese adoption, so I was excited to add this title to our reading list. Red Thread Sisters is about two Chinese girls who are best friends growing up in an orphanage. Wen was abandoned at age 6 by her family at the orphanage after her father lost his job and they couldn’t afford to keep two children, while Shu Lin was left at the orphanage as a baby because of a deformed foot. While the two often dream of being adopted, in the end, it is only Wen who is picked by an American family. When the book opens, Wen is meeting her adoptive family for the first time and having to say goodbye to Shu Lin. Wen moves to the Boston area and tries to get used to life with her new parents and at her American school. She has a lot of trouble trusting that her parents will keep her and that she won’t be sent back to China if something goes wrong. Wen tries to reciprocate her younger sister’s affection, but she doesn’t know how to be a member of a family, or how to express love for someone other than Shu Lin. Meanwhile, she misses her best friend terribly, and feels guilty that she is in America living a comfortable, privileged life while Shu Lin is still at the orphanage. Before she left, Wen promised Shu Lin that she would find her a family in the United States. She soon realizes that that is a hard promise to fulfill. At first, she tries to talk her new parents into adopting Shu-Ling too, without understanding how big of a commitment an adoption is. She then starts to learn more about the adoption process and how she can help Shu Lin’s chances of being adopted. Red Thread Sisters prompted a good discussion among the group about girls in China, international adoption and the challenges of being integrated into a new family. We also talked about friendship and responsibility, and whether Wen should have made her promise to Shu Lin. The girls liked the book – it held their interest and they felt compassion for the characters. We all agreed that there wasn’t enough detail in the book: Wen seemed to have little problem understanding what was happening at school, and the months just seemed to fly by with no sense of her daily life in America. She was also pretty inconsiderate of her adoptive parents’ feelings, but that was in part due to her inability to connect emotionally. 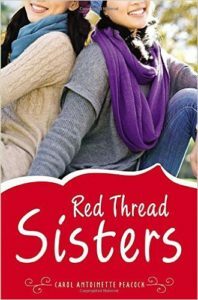 Overall, Red Thread Sisters was a good perspective-broadening book, even if it wasn’t the best-written book we read this year. It led to a robust discussion between the girls and mothers, and that’s usually the sign of a good book club book.